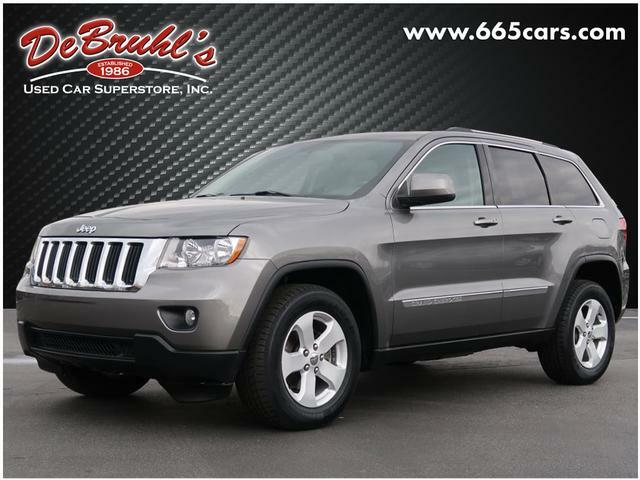 * TELESCOPING STEERING WHEEL * * 6 Cylinder engine * * GREAT DEAL AT $18,950 ** ONLY ONE PREVIOUS OWNER * * 2013 ** Jeep * * Grand Cherokee * * Laredo * Make sure to get your hands on this 2013 Jeep Grand Cherokee Laredo with a push button start, parking assistance, a navigation system, a leather interior, dual climate control, heated seats, traction control, AM/FM radio and CD player, anti-lock brakes, and dual airbags before its too late! It comes with a 6 Cylinder engine. Rocking a sleek gray exterior and a dark graystone/medium graystone interior, this car is a great pick. With an unbeatable 4-star crash test rating, this SUV 4X4 puts safety first. This is the vehicle for you! Give us a call today and dont let it slip away! DeBruhls Used Car Superstore is the largest independent auto dealer in WNC! We offer a full range of financing with our guarantee credit approval, everyone is approved here.